Small space living does not necessarily mean that there is no space for you and your stuff. This traditional style flat in the attic works as a functional atelier. With a classic sofa in the living room and open shelves and a bookcase in a working place, this flat meets all the needs of a student who lives here. After a tense day at work, there is nothing better than coming home. 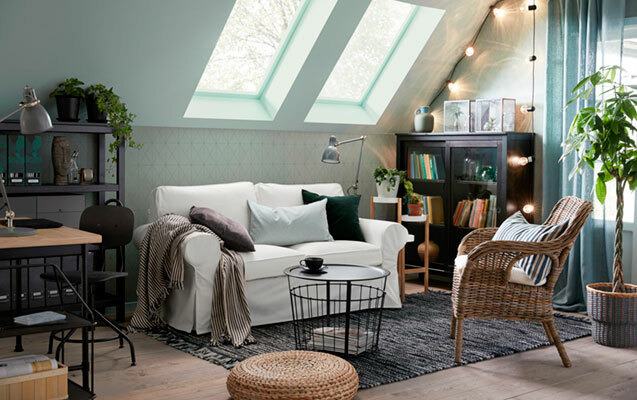 Back to your airy modern living room with high ceiling, calming interior and quality living room furniture, just like this cosy and stylish sofa. This light and roomy living room is a great place to spend time together as well as on your own. The family of four, parents and teens, find lots of activities here: from family‘s library in the BILLY bookcases to table games and photo albums. 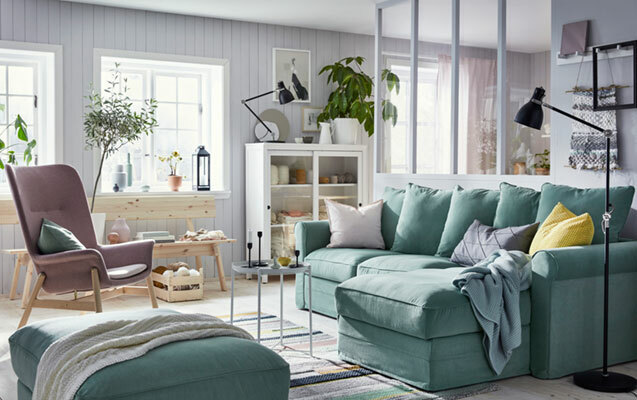 In case the two LITHULT 2-seat sofas are not enough for everyone, there are two additional stools and the RÅDVIKEN armchairs. Living single means you can furnish the living room without any rules. Combine your industrial style TV bench and shelving units with persian rugs or hang a door with blackboard surface instead of a painting. Welcome to the luminous pastel living room in the cottage of young couple, where a semi-open partition serves for a wall between kitchen and living room. Functional living room furniture like modular sofa makes engaging in different activities and being together much more convenient. This popular traditional style living room belongs to a couple of entrepreneurs and was furnished to fit all of their needs, including leisure and business. The HAVSTA cabinets and storage combinations are roomy enough to store his and her stuff. And when this couple wants to take a break, they can use their incredibly comfortable armchairs and chaise longues. Living small and furnishing on budget doesn‘t mean giving up on quality and function. A flexible room for a young family with kid has everything to meet their needs: a modular sofa-bed, cabinets on different heights, a nest of tables that can be pushed together to save space, and other multifunctional furniture. 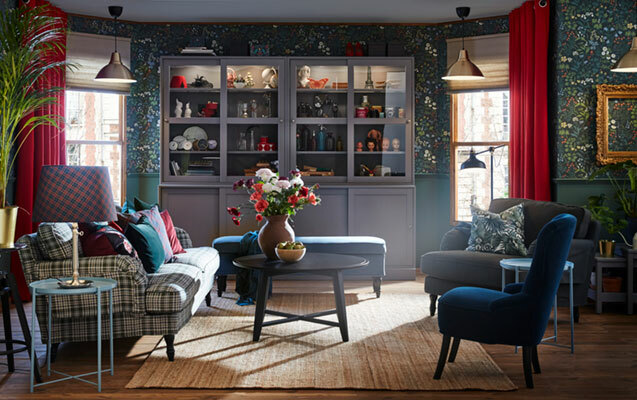 A stagey living room in traditional style is a great place for creative personalities. This one is designed for a middle-aged couple and furnished with mismatching in mind. Mix benches with stacks of stools and chairs, use deep colours and floral patterns, and don‘t forget the lighting! Make a statement with ceiling lights, zone with reading lamps and create atmosphere with mood lighting. 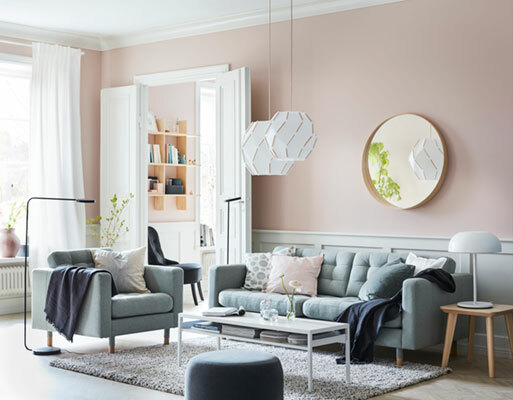 This Scandinavian modern style living room was designed and furnished for a young couple. The cosy and functional transitional room is filled with calm colours and smart solutions. 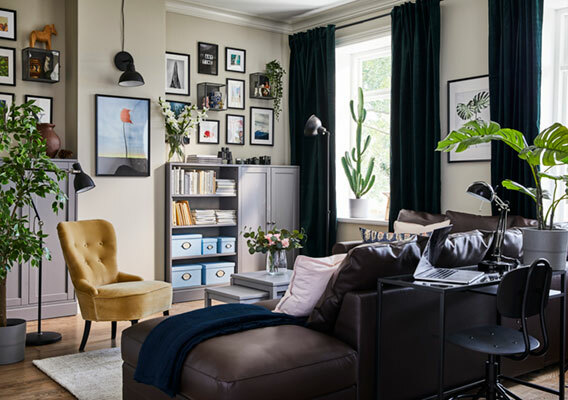 The wall between two doors is dedicated to the storage system with closed cabinets, open shelves and small organisers and as there is no sofa, the tenants have two stylish and comfortable armchairs instead. Three rooms in one-room apartment? Why not. 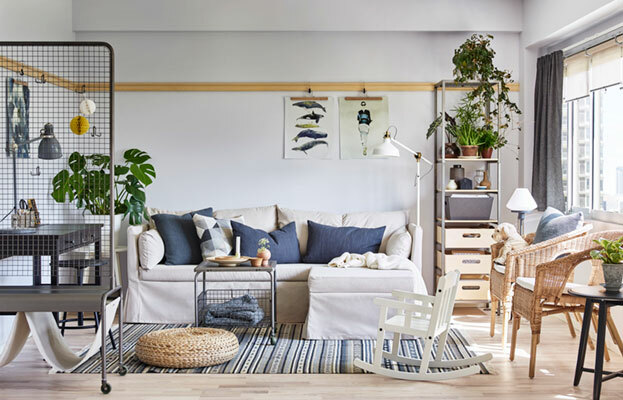 From VEBERÖD shelving unit and room divider to corner sofa-bed to desk for working or rocking chair for the little ones, this multifunctional living room has enough space for everything a young family with children could need. This modern couple‘s flat in old town has a living room with little space yet lots of solutions. Due to smart furniture and storage, there is enough space for two and all their stuff. A compact 2-seat sofa takes the centre stage, and the two side tables are light and small enough to lift with one hand, as the handles makes them easy to carry around the home. Not to mention the EKET wall-mounted cabinets that make this calm interior with muted colours bolder. When you are a big family with lots of stuff, the EKET storage system is a great solution for everyone who lives in the same room. The lower shelving units and closed cabinets are perfect for children‘s toys, and the high cabinets let store books, trophies and other things out of the reach of those curious little fingers. When you can afford more and have a spacious apartment in the city centre, let your living room furniture take the centre stage. This living room was furnished for a couple of entrepreneurs that prefers strict contemporary style. Two LANDSKRONA armchairs in leather and the corner sofa have a look of timeless design and are covered under the 10-year guarantee. This small studio living room in the suburbs was furnished for a backpacking couple of travellers and collectors. 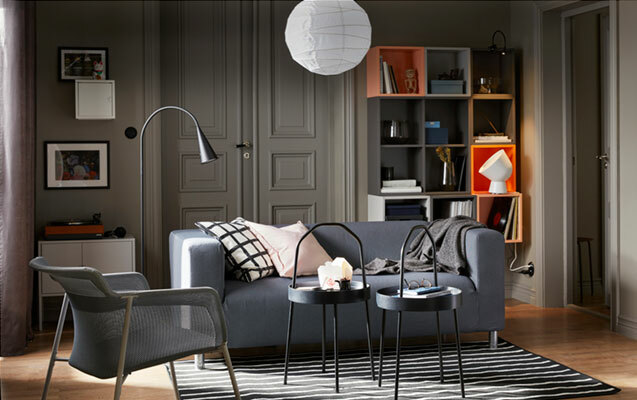 With HAVSTA storage combination, there is enough space for all their stuff: from books to maps to souvenirs. Picture frames on the walls protect their travel photos, and the VITTSJÖ laptop table behind the sofa comes in handy for planning the future excursions. A living room or a little museum? This living room belongs to a couple of treasure hunters. 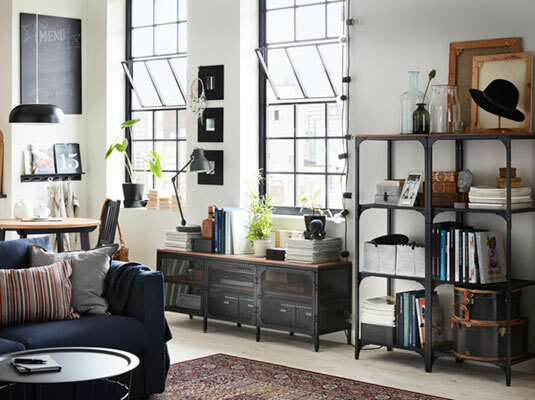 It has all the collector’s essentials: open shelving units, picture frames, glass domes and display stands, and a leather sofa that will last a lifetime. A great place to relax on after visiting the ‘exhibition’.